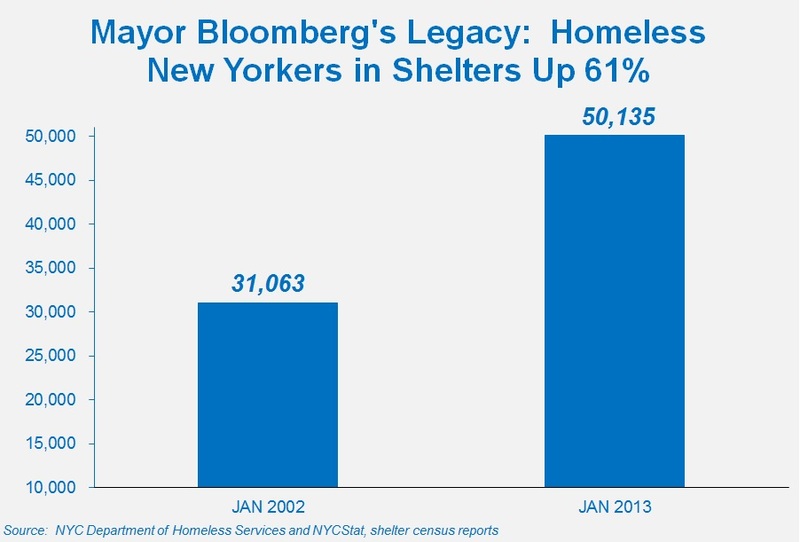 Yesterday the Coalition released “State of the Homeless 2013,” which documents how, for the first time ever, more than 50,000 homeless New Yorkers are sleeping each night in municipal shelters – a shocking 61 percent increase since Mayor Bloomberg took office. Sign our petition here, telling the Mayor it’s time to act! The report also shows that more than 21,000 homeless children are sleeping each night in NYC shelters – up 22 percent in the past year – and that family homelessness has increased by a shocking 73 percent since Mayor Bloomberg took office. 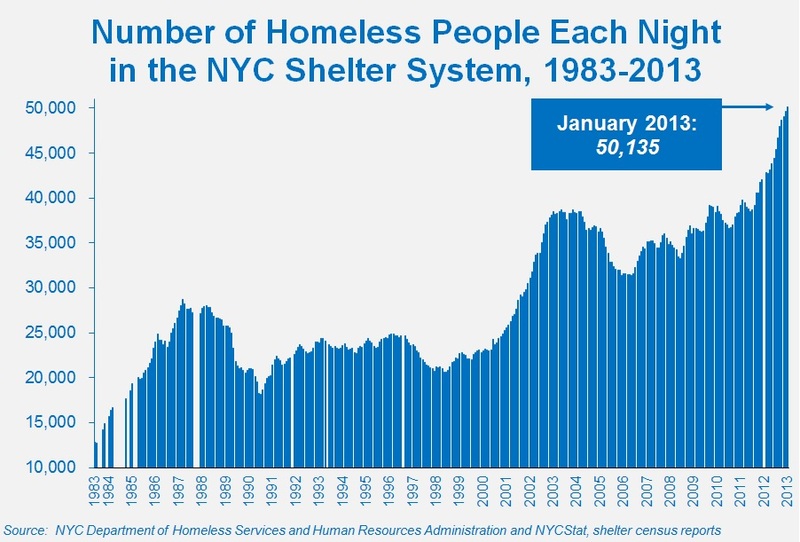 The report, entitled “50,000: The Bloomberg Legacy of Record Homelessness,” tracks the rise in NYC homelessness over the past year and since the Mayor took office. It analyzes the failures of Bloomberg’s homeless policies that have resulted in record homelessness, in particular the Mayor’s elimination of permanent housing assistance for homeless kids and families. And it outlines an action plan for the next NYC mayor to reduce homelessness. Families have become a larger share of the nation’s homeless population, growing 1.4% from 2011 to 2012, after their numbers fell as the economy emerged from recession. The numbers in New York, however, are starker, according to a report to be published Tuesday by the Coalition for the Homeless, a New York advocacy group, citing New York City government figures. “New York is facing a homeless crisis worse than any time since the Great Depression,” said Mary Brosnahan, president of the Coalition for the Homeless. The “State of the Homeless 2013” report and yesterday’s press conference were widely covered by national and NYC news organizations, including WNBC News, the Huffington Post, WCBS News, Salon, and WNYC radio. Sadly, Mayor Bloomberg’s response to the report consisted entirely of stragely misguided attacks on Coalition for the Homeless, and efforts to point the blame at the State and elsewhere, as Capital New York and today’s Wall Street Journal reported. “Rather than taking responsibility for his Administration’s failure, Mayor Bloomberg continues to blame everyone else for record homelessness in NYC. Today, he blames the State and, ludicrously, the Coalition for the Homeless, for ending Advantage – even though Advantage families were returning to shelter in record numbers. Last week, he blamed mentally-ill men and women suffering on our streets for not wanting help – even though he’s still in court trying to make it more difficult for them to get into emergency shelter. He blames homeless families for trying to game the system – even though they clearly have nowhere else to turn. “Mayor Bloomberg can try to deflect attention away from his disastrous policies all he wants, but 50,000 New Yorkers would not be homeless today if he had chosen to invest in the strategy of moving families into permanent, affordable housing that Mayors Koch, Dinkins and Giuliani all used with success.